Flu seasons vary from year to year and experts say they are almost impossible to predict. This year, the annual epidemic is unfolding more slowly than it did last year. "Flu activity nationally is elevated," the CDC says in its latest report on flu. "Calculations are based on adjusted rates of laboratory-confirmed, influenza-associated hospitalizations collected through a surveillance network that covers approximately 8.5 percent of the U.S. population, or about 27 million people," the CDC said. 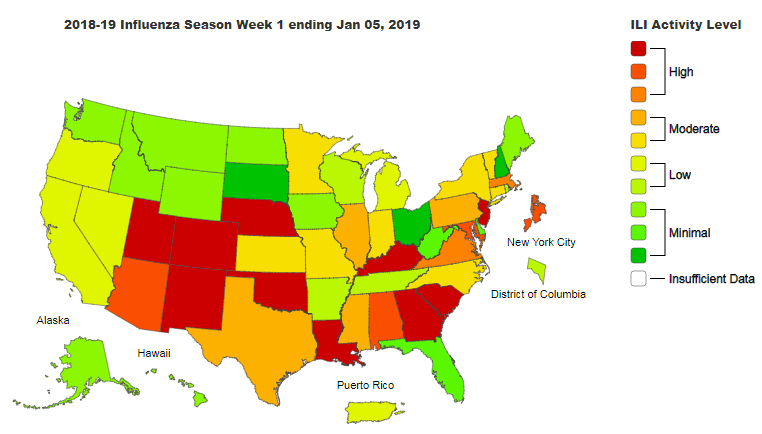 In the past, the CDC has waited until the end of the season to release estimates of how many people have been affected by flu. "It's still not too late to get a flu vaccine. Year in and year out, people who get a flu vaccine are better off than people who do not get vaccinated," the CDC said. "Flu vaccines reduce the risk of flu illness and serious flu complications that can result in hospitalization and have been shown to be life-saving in children." Quick treatment can save lives, the CDC said. There are several influenza medications on the market now. "People who are very sick or who are at high risk of serious flu complications and get flu symptoms should see a health care provider promptly for possible treatment with a flu antiviral drug," the CDC said.